The U.S. Department of Energy's Office of Energy Efficiency and Renewable Energy announced a grant of up to $2.5 million to NatureWorks in support of an ongoing program that aims to utilize methane, a potent greenhouse gas, as a feedstock for the company’s Ingeo biopolymers and intermediates. Read more. A material’s eco-profile is an essential input to any full life cycle assessment (LCA) conducted on products made from that material. Using the latest databases and computer modeling available and partnering with PE International, NatureWorks has updated its four-year-old Ingeo eco-profile. 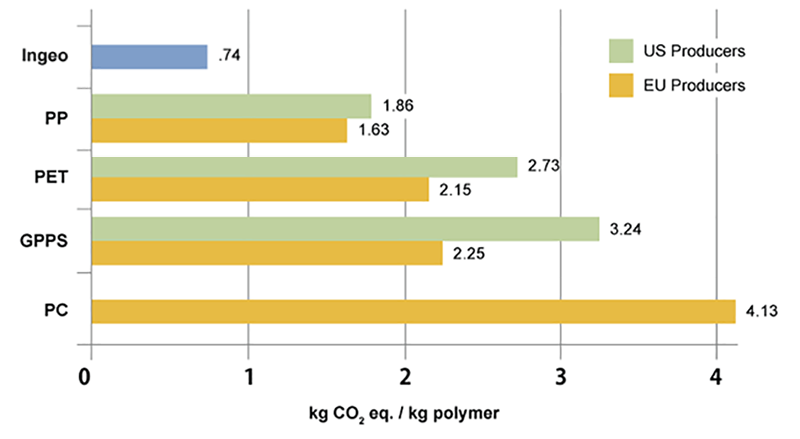 Initial results reinforce the fact that compared to such commonly used plastics as polystyrene (PS), polyethylene terephthalate (PET), and polycarbonate (PC), Ingeo polymer pellets emit fewer greenhouse gases and consume less non-renewable energy during manufacture. Read more. Penn State has won the “2014 Outstanding Higher Education Award” from the National Recycling Coalition. Beaver Stadium on the Penn State campus, which attracts more than one million visitors each year, partnered with the Green Sports Alliance, NatureWorks, StalkMarket (Ingeo food serviceware), and GreenDrop (collection bins) to achieve zero waste in the suites section of the stadium. Penn State is expanding the program to include other areas within Beaver stadium as well as additional on-campus athletic venues. Read more about Penn State's program & how Ingeo contributed. Nearly a third of Americans would be more likely to attend a game or concert if the stadium recycled and composted all the trash left behind, a new survey has found. One in five would also purchase more beer, hot dogs, and nachos. At stake are millions of dollars in ticket and concession sales, as well as tons of wasted resources, says Suzanne Shelton, CEO of Shelton Group, which conducted the survey. Read more. In NatureWorks third year supporting the Green Sports Alliance in producing their annual summit, NatureWorks Public Affairs Director Steve Davies joined a panel “Digging Deeper Into Compost” hosted by the Natural Resources Defense Council (NRDC) at the Green Sports Alliance Summit this summer. In a session that included panelist discussion of everything from compostable product specification, to collection bin design, Davies detailed the most recent work at Penn State with Ingeo foodservice ware. A number of NatureWorks partners also exhibited their offerings. The Green Sports Alliance is a nonprofit organization with a mission to help sports teams, venues, and leagues enhance their environmental performance. The Alliance brings together venue operators, sports team executives, and environmental experts to exchange information about better practices and develop solutions to their environmental challenges that are both cost competitive and innovative. Alliance members currently represent over 120 professional and collegiate sports teams and venues from 7 different sports leagues. M + N’s REVOLUTION® sunshade is now the first sunscreen to earn the Cradle to Cradle Certified™ Products Program gold-level certification and that REVOLUTION metal has become the first metalized sunscreen to earn a silver-level certification. Products are evaluated on five multifaceted criteria – material health, material reutilization, renewable energy and carbon management, water stewardship, and social fairness. NatureMold™ from Ahlstrom is a new series of frozen, fresh, and semi-fresh food bowls and trays that are made with low-carbon-footprint materials such as vegetable parchment, Forest Stewardship Council certified paper board, and Ingeo. These bowls and trays, an alternative to aluminum and plastic, can go from freezer to microwave to dining table. Food companies interested in more sustainable packaging will want to consider the NatureMold series. Read more. Södra, the sustainable forestry cooperative in Sweden, and James Cropper Plc, a leading specialty paper and nonwovens company in the UK, recently started to collaborate and created cross-functional expert teams with the aim to develop DuraPulp solutions for a wide potential range of applications. DuraPulp is heat press wood fibers, the same fibers used in the production of paper, and Ingeo. DuraPulp is lightweight, strong, and capable of being used in a host of applications from high-end packaging to horticultural supplies to automotive components. Demonstrating DuraPulp’s inherent strength, the material was molded into a thin lightweight chair. Developers created a desk lamp out of DuraPulp to showcase out-of-the-box thinking in terms of potential uses. Read more. Dairy Home, an organic dairy and fresh farm goods business in Thailand, has selected Ingeo for its yogurt packaging. The company’s emphasis on sustainability makes Ingeo packaging a natural fit for Dairy Home’s organic yogurt. Dairy Home’s senior manager said the competitive price for Ingeo packaging made the choice feasible. Read more. The new Convergreen Ingeo-based film from Converflex continues to interest candies and chocolates manufacturers in Argentina as an outer twist wrap. It prints well and can be metalized. Film thickness in these applications is 25 mic, and tests indicate that Convergreen runs well on more than a half dozen of the most popular twist wrap machines. Ingeo-based film can be used as naturally advanced alternatives to PVC, BOPP, and other films. The manufacture of the Ingeo-based film releases 74 percent less GHG emissions than the typical PVC wrapper foil it replaces. Most recently, Cabsha Alpine, Alka and Saquito confections became the latest to feature the Convergreen film wrap, which vibrantly catches the eyes of consumers. Natural Shield bags are currently the thinnest bags made out of Ingeo – only eight microns thick. Because Natural Shield bags are so thin, water vapor and gas transmission are very high and some fresh foods are better preserved with these properties. On the other hand, aroma transmission is extremely low, preventing odors from being released. While this film is quite stiff, it is quiet when handled. The bags are naturally re-closable thanks to the film’s unique twist effect. Natural Shield also shrinks at energy saving low temperatures, making it an ideal choice for shrink-film applications. The film also has good anti-static qualities. Magical Film Enterprise Co. applied a thin film of Ingeo over stiff paper and/or corrugated board made from renewable resources to develop trays and takeaway containers for fast food restaurants. The containers and trays are compostable in municipal composting facilities. The Ingeo film provides an effective moisture barrier, preserving the stiffness of the paper, and offers an alternative to polystyrene foam containers. SPI: The Plastics Industry Trade Association presented the second annual Innovation in Bioplastics Award to Teknor Apex for the development of Terraloy® Ingeo-based compounds, which exhibit both high impact and heat resistant properties. SPI’s Bioplastics Council noted that Teknor Apex’s free-flowing resins, used in both injection molding and extrusion/thermoforming processes, streamline the Ingeo crystallization process and retain key bioplastic values such as FDA compliance, high bio-based content, and compostability. Read more. Calysta, Inc. announced it has successfully fermented methane into lactic acid in its laboratory under research collaboration with NatureWorks. Lactic acid is the building block for Ingeo, lactide intermediates and polymers used in consumer and industrial products worldwide. The joint development program, started in June 2013 between Calysta and NatureWorks, is focused on creation of a commercially viable methane-to-lactic-acid process. The key aims are providing a structurally simplified, lower cost Ingeo production platform and diversifying NatureWorks’ feedstock portfolio. Read more. Professor Judd Michael (Penn State University) and Doug Kunnemann (Global Segment Leader Foodservice), presented on how Ingeo serviceware can enable zero waste initiatives. Pauline Ning presented Naturally Advanced Ingeo Fibers and Nonwovens for Disposable Hygiene Products. Steve Davies, Public Affairs Communications Director, participated in the 500 Billion Pounds: Transitioning from Plastic panel. Jim Nangeroni, Technical Service and Development Global Functional Lead, presented Ingeo Bioplastics Expand Applications Space with Continued Performance Improvements. Eamonn Tighe will present on Ingeo PLA in fibers and nonwovens. Erwin Vink will present The value of using sugar beets as the 1st generation feedstock for bioplastics in Europe. Marc Verbruggen, CEO, will present The Big View: What’s Next in Chemicals and Biomaterials. Robert Green, Global Fibers/Nonwovens Segment Leader will present on the Design & Materials: Preferred Synthetics and Man-Made Cellulosic Materials panel. Dan Sawyer, Global Segment Leader New Business will present on sustainable 3D printing. Steve Davies, Public Affairs Communications Director, will share Ingeo case studies in the breakout session Material Reutilization: Circular Strategies. Watid Watanyupaisan, Technical Service & Development Engineer, will present Ingeo Bioplastics Expand Applications Space with Continued Performance Improvements. Salvador Ortega, SA Business Development Manager, will participate in the “Biobased Labeling” panel and stop by our booth. Stop by our booth to see the latest innovations made from Ingeo! Want to attend NPE? Register for a complimentary guest pass, courtesy of NatureWorks.